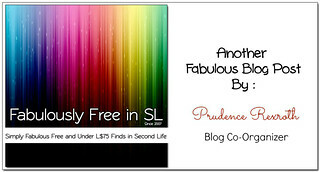 Hello, welcome back to the blog Fab Free’rs! So I did a little more frog hunting on the Enchantment Frog Prince Hunt and decided I wanted to share even more of the free hunt gifts with you. There are lots of cute prizes to be had, and the Frog Prince Hunt does not end until August 31st. The Flower Mask – This pretty vine of flowers is the free Frog Prince Hunt gift at Snowpaws. The beautifully detailed mask comes in 2 sizes, each with 2 attachment point options. Also included is a held version of the mask which I think is a cool addition. Hint – There is no elevator to success, you have to take the stairs. The Swimsuit – I think there’s something really beautiful about this swimsuit from Have Unequal. It is their free gift for the Frog Prince Hunt. I think it’s the combination of the soft pink color and the gold details. There’s even a pretty “embroidered” gold scarab type image on the back. This gift comes in a Maitreya fit only. Hint – The little frog is in love with the butterfly. 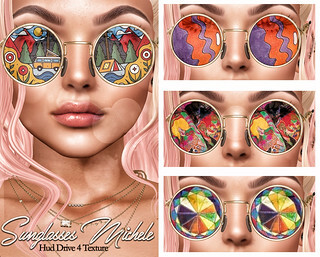 Categories: accessories, Free, hunts, mesh, other, swimwear | Tags: Catwa Koura, Clawtooth, Clawtooth Hair, Enchantment Frog Prince Hunt, Enchantment Hunt, Enchantment Hunt Gift, Essences Blake, fab free, Fab Free in SL, fabfree, fabfree in sl, fabulously free in SL, Fashion Freebie, Foxcity, FOXCITY Poses, free, free fashion, free hunt, free hunt gift, Free Hunt in SL, free swimwear, freebie, Frog Prince Hunt Gift, have unequal, Have Unequal Frog Prince Hunt Gift, Hunt in SL, Hunt Prizes, Maitreya Lara, Prudence Rexroth, Second Life, sl, sl hunt, Snowpaws, Snowpaws Frog Prince Hunt Gift | Permalink.